After the Vampire Wars is a supplement by The Design Mechanism for its RPG Mythras, formerly known as RuneQuest 6th edition. Written by John Snead, it allows you to play games with supernatural beings such as vampires, werewolves, half-fae or perhaps powerful sorcerers or psychics, in an alternative version of the current world where these kinds of legendary beings are no longer a mystery, but a reality widely accepted by society, or most of it, anyway. In other words: a book to play the urban fantasy genre with the D100 system. (Puedes leer esta reseña en español aquí). 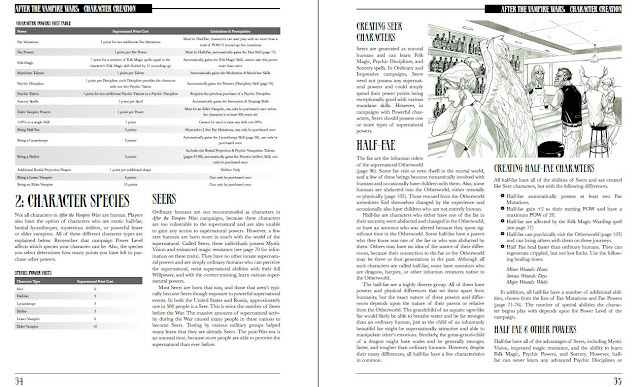 This Mythras supplement is 152 pages long, comprising background information and new game rules for it. The text is laid out in double columns, with some explanatory text boxes. 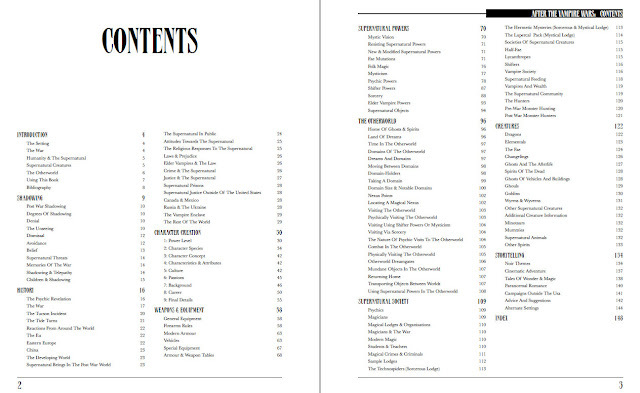 The PDF index includes links to all the sections. 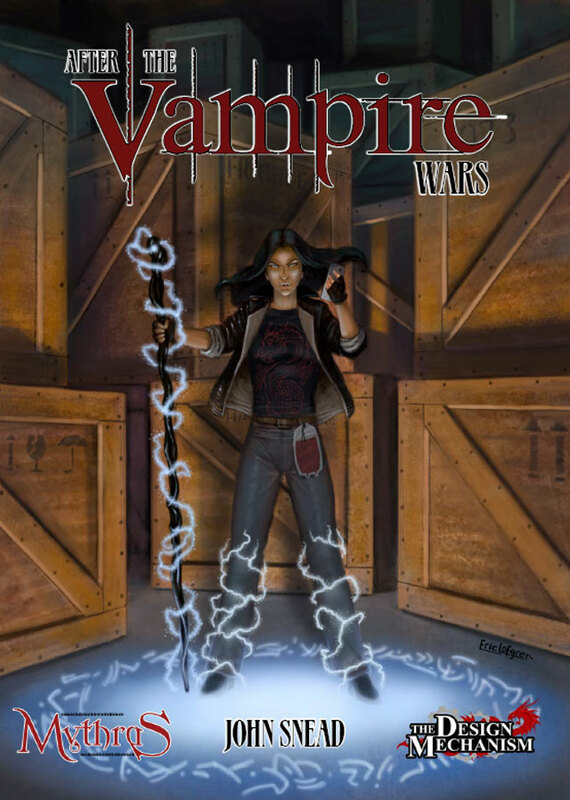 The cover by Eric Lofgren depicts a vampire with a cell phone in one hand casting a ritual spell with the staff she holds in her other hand. Although it does mix modernity with the supernatural, it is too static and rather bland. Maybe it would have been a better idea to show more than just one supernatural character. For example, the cover of the Chaosium edition, featuring a famous half-fae and her werewolf bodyguard, was far more appealing. 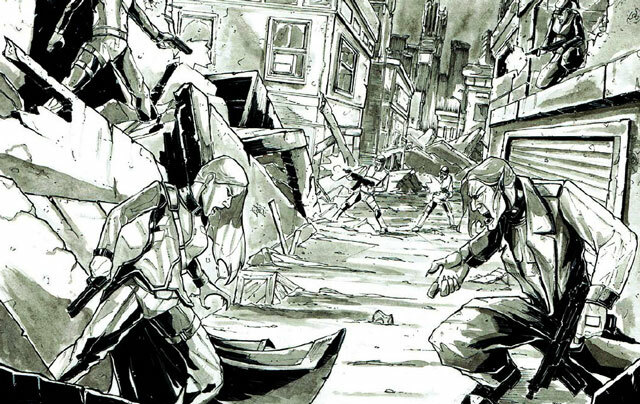 On the other hand, the interior art by the same artist as well as by Dan McKinnon and Anderson Maia follow the typical style of other books by The Design Mechanism, that is, black and white, somewhat scarce and of medium quality. On a side note, I noticed that some of the art Eric Lofgren did for the sadly unpublished RuneQuest: Adventures in Glorantha has been reused here. In general, I wish they could have given it a more attractive look. BTW, the PDF is 13$ and the physical book 25$. 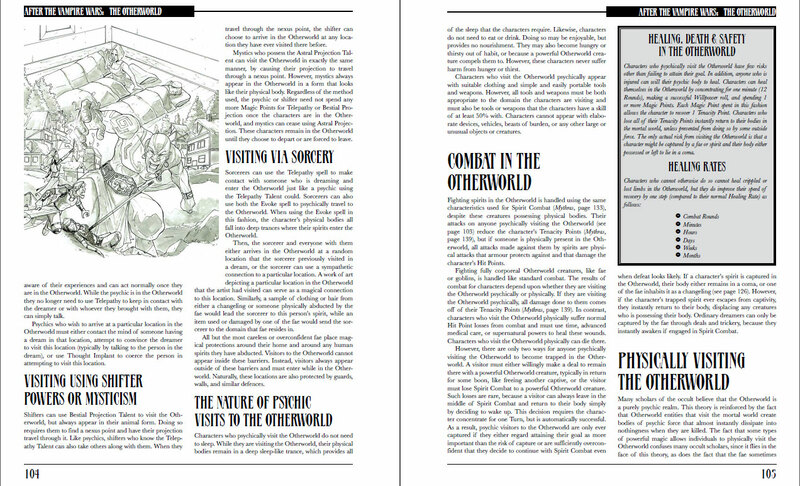 The version of this supplement that Chaosium published in 2015 was based on the rules of its Basic Role Playing system. However, shortly after that the new board wiped the slate clean of all the titles that used the BRP system, so the author took the supplement to The Design Mechanism and he revised, expanded and adapted it to work with Mythras. I can't say what the differences are, but below I'm going to review the content of the new edition section by section, and then I'll finish with a general assessment. To start with, the author reviews the urban fantasy genre and lists several sources of inspiration: novels, TV series and films. Any reader will know most of them, like Buffy the Vampire Slayer or the Grimm TV series, which goes to show this is still a very popular genre that can have a very good acceptance as a RPG campaign among your potential players. Obviously, novels related to other urban fantasy RPGs are notably absent from the list (such as the series of games like Vampire, Werewolf, Mage or Changeling) but including them would have been counterproductive for the author. Moreover, the official setting John Snead describes in his book is quite different from the one White Wolf offers, since, as you will see, it draws much more inspiration from the True Blood TV series than from Anne Rice's novels. Apart from this, the author also sums up here the contents of the different sections of the book. At this point I already noticed the writing is very good, clear and to the point. The contents. Click on the image to enlarge. This section focuses on an element of the setting that explains why most people aren't aware of the existence of magic and supernatural beings. It is all very well thought out and I especially like how every degree of belief or negation of the supernatural is explained. No less than six different degrees are defined, each with specific game effects. For example, if an ordinary person clearly sees a vampire sucking the blood of a victim, the Shadowing forces him or her to make a Willpower roll, otherwise that memory will soon fade away. It even specifies what happens if a psychic reads the mind of that person in order to find out what he or she really saw. I also liked details like children up to 15 years not being affected by Shadowing. Such a nice touch. Or how police officers tend to bump into the supernatural more often than other people, which reminded me of Mutant City Blues, a RPG focused on a section of the Police Department in charge of investigating mutant or supernatural cases. It could be not only perfectly possible to play such a campaign with After the Vampire Wars, but also very cool. Lastly, the game effects of this phenomenon reminded me of Aquelarre. It was in that RPG about medieval Spain where I first read the notion that those who believe in magic and the supernatural are way more prone to be affected by spells. 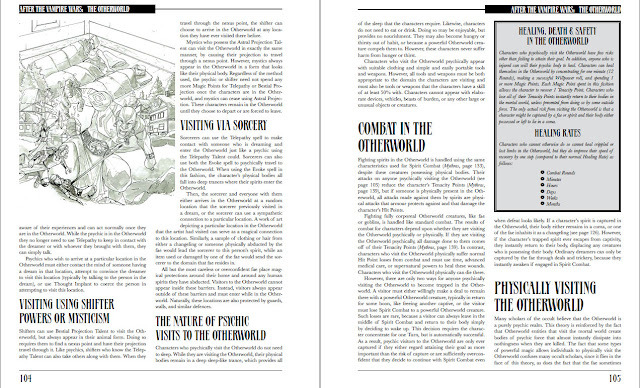 As in Aquelarre, this is well represented by the game rules included in this Mythras supplement. And it goes beyond just spells. For example, a vampire unconsciously prefers sucking the blood of someone who believes in magic than from someone who negates its existence. All in all, a very interesting section, even if I must confess that it would be difficult for me to remember the exact modifiers for each degree during a game. For this reason, if I were to run a game in this setting, I would first note all this down. Here is where all the background of the official setting is explained. Long story short, between 2008 and 2010 the US Government found out vampires are real and set about eliminating them all, but they fought back and it all escalated very quickly into a full war, nuke included! After that, some countries accepted the existence of supernatural beings and magic in society. Another similar war broke out in Russia, but the outcome was somewhat different there. Even though the supplement focuses on the situation in the U.S. and Canada, I like that the author has taken the time to describe the situation in other areas of the globe, even if briefly. In fact, setting campaigns in other countries would also be very interesting. I must say, I love reading this sort of alternate versions of history, specially in urban fantasy worlds. While reading this section I remembered the background of the Sixth World of Shadowrun. I enjoy seeing how the author weaves it all starting from the initial divergent event and then extrapolates the likely consequences that lead to a credible parallel universe where the supernatural not only exists, but is accepted by most people. Aside from the Vampire Wars between the governments and vampires, this section also describes several aspects of the world afterwards, meaning the present time After the Vampire Wars. For instance, what public opinion thinks bout supernatural beings, the opinion of religions, and above all, how the law has been adapted to the new situation. This offers many ideas for scenarios. It surprised me that all characters in the book are created starting from the human set of stats. That is, some of the stats of a vampire, a lycanthrope or a half-fae are evidently better than those of an ordinary human, like Strength or Dexterity, but all characters are generated by rolling the same dice or assigning the same amount of points to stats, and only after that, some modifiers are applied according to species or supernatural powers. For example, a werewolf has +2 STR and +1 DEX, whereas a half-fae has +2 POW. Actually, though, stats aren't crucial in Mythras, so the power level of characters is better measured by their innate or magic powers. And in order for these powers to be somewhat balanced among the group of player characters, players have several points to exchange for supernatural powers during character creation. For example you can spend one point and get the Folk Magic skill and several spells, or spend two and get two sorcery spells, which would then also include the basic percentage in Invocation and Shaping. Or you can spend 3 points and get all that! As for the supernatural species, the book describes basically four. First we have vampires, always the most outstanding characters in this kind of stories, as well as in the setting for After the Vampire Wars. In game terms, they look like the ones included in the Mythras rulebook with only a few tweaks. There are also werewolves, and they don't turn into giant wolves, they just grow claws, fangs and hair (think Teen Wolf! ), but if you wanted them to turn into the usual wolf-human hybrid you can still play them like that and not change anything. They heal faster, have an aura of fear and they have a berserker ability than can be problematic at times. Following the trend set by the World of Darkness, you can also be a half-fae, humans with some fae ancestor whom they have inherited special powers or mutations from. "Normal" human characters will be seers, who are capable of perceiving the supernatural world. Finally there is another species called shifters: humans who feed on other people's strong emotions and who can project their conscience in the physical or astral shape of an animal. I'm not sure what film or novel does this species originally come from. The book claims these beings are the origin of the legends about shape-shifters, which seems a bit far-fetched to me. However, there is no doubt they offer more variety for those players who always want to be something completely different from the rest of the group. Aside from all these innate powers that vampires, lycanthropes, half-fae and shifters have, they can learn some of the available types of magic: Folk Magic, Sorcery, Mysticism or Psychic powers. However, to be any kind of supernatural being already has a cost in supernatural points, 3 in the case of lycanthropes, whereas being a seer costs 0 points, so in general, seers will often be more powerful sorcerers, mystics or psychics, as they have more points to spend in magic during character creation. In this way, supernatural points are useful for balancing the power in the initial group of player characters. This supplement also presents several character concepts such as private investigator specialized in supernatural cases, a shifter looking for clues about the origin of her race or perhaps a half-fae exploring the Other World (see below) to find out its secrets. These are useful for uninspired players. Plus, it includes ideas for 3 different kinds of campaigns. This is interesting because it relates to the 3 levels of initial power level the group of player characters can start with. If you establish they are "ordinary" characters, they will be common people with just some or other supernatural power. They could be monster-hunters, occult detectives, and so on. At this level, vampire characters are not recommended, since their set of innate supernatural powers would make them much more powerful than any other character. The next power level is where «impressive» characters belong. These have made themselves a place in the supernatural society and are capable of facing big supernatural dangers. This could perhaps be the level Harry Dresden and his friends or even John Constantine belong to. Here any of the supernatural species are available, and most of the characters will still have connections with ordinary mortals. To finish with, you can choose to start play with «powerful» characters. As the name suggests, these characters are some of the most powerful in their area and they often have an important position of power. For example, several 100-year-old vampires each ruling a different city. In this case, it is especially interesting to know what they did during the Vampire Wars as it can lead to campaigns much more related to the background. As I mention later on, you can also start at the ordinary level and improve gradually, but I find it really useful that the book offers so many options for campaigns. Some of which you might not even have thought of. Anyway, I find it excellent that the author has taken the time to present different choices in terms of power level for different kinds of campaigns. These could be your "ordinary" characters: a lycanthrope, several seers who are detectives or hunters and a half-fae. During character creation, every difference in starting power level means better dice for stats, more points to assign to skills and, above all, more supernatural points to spend in powers for your character. An "ordinary" character, for instance, is created almost as described in Mythras and can start play with her main skill at around 70%. However, "powerful" characters start with their main skill at around 140% and may be vampires capable of dominating whole crowds or half-fae who are also extremely talented sorcerers. Not only that, but characters at each higher level acquire more potent abilities than the ones from a lesser level. For example, it only takes one turn for an "impressive" sorcerer to cast a spell, whereas an "ordinary" one needs a whole round. Likewise, the former regain lost magic points quicker. I thought this was just only due to game-mechanics or, as the text claims, because more powerful characters have a "stronger connection to the supernatural world". That's why, if you play enough sessions for the characters to get to the next level, it could look rather artificial to explain this change in power by saying "OK, you just levelled up". Fortunately though, in the Storytelling section (see further down), the author explains how to pass from one level to the next in-game during a long campaign, and it has nothing to do with experience points, but through extraordinary events in the campaign that affect the group as a whole. It's all well-thought. Additionally, since the setting is almost just like our current world, this section includes game stats for several modern skills like Computers or Electronics, and it offers 23 modern professions, some of them focused on the urban fantasy genre. For example, mechanic, pilot, politician, but also illuminated master, technomage, vampire hunter and even SSF soldier (SSF stands for Supernatural Special Forces!). Everything you may need, really. All right, you can be vampire hunter! A demon hunter, you say? OK, that could work as well, yes. I love that this section includes tables for social class and family like in the Mythras or RuneQuest 6 rulesets, but adapted to our current times. And, best of all, a table of 100 background events adapted to this particular urban fantasy setting. There's even an additional table with 10 events for those powerful characters who participated in the Vampire Wars, so in case your players are lacking inspiration, they can roll in this table and generate seeds for future scenarios. 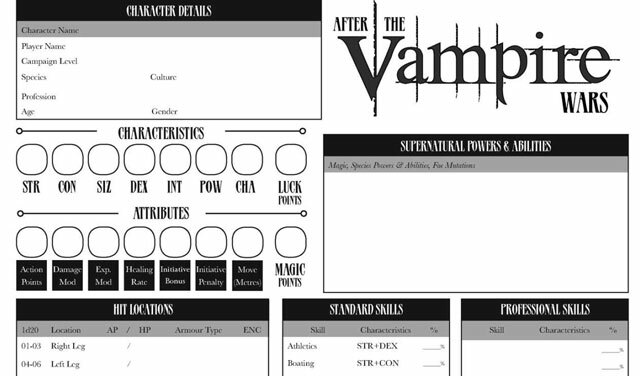 Lastly, you can find here the double-sided character sheet for After the Vampire Wars. The most relevant data for the game is on the front side, which is a plus. For example, the fatigue levels are key, since they are used to measure the blood vampires have or the blood they have sucked from victims. As the book is set in our current times, there needed to be a section about modern firearms. And so we get a long list of weapons, pistols of every caliber, machine guns, sniper rifles, etc. Fortunately, it doesn't go into the insane level of detail of other games such as Shadowrun. Here all weapons are generic, so all .45 guns share the same game stats and in my opinion it is much better this way. Logically, all these weapons include their own new special combat effects and modifications to those already present in the basic ruleset, as well as new weapon traits. 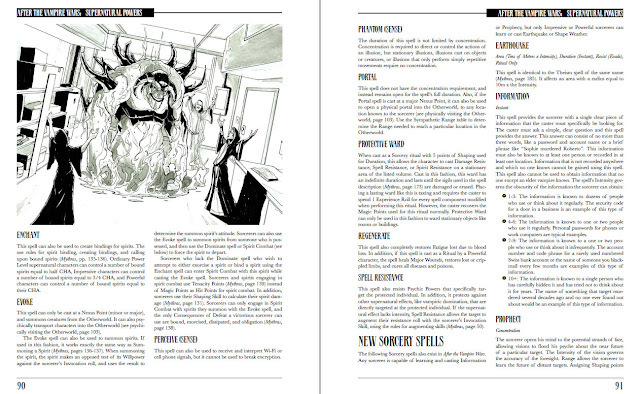 The Mythras rulebook, unlike the previous RuneQuest 6th edition, already includes some combat effects for firearms. In fact, these rules are the same you can read in the Firearms supplement The Design Mechanism published as a free to download PDF before they published Mythras. But in this case, the list of weapons is limited to the current technology, with the addition of grenades and missiles, among others. These rules are lethal, by the way. For instance, the effect Drop Foe means that, if a weapon causes even a Minor wound, the victim can be incapacitated if she does not make a good Endurance roll. There are also rules for vehicles. As with weapons, the game stats are generic for ease of use. For example, there are only two kinds of car: sedan and sports car. The rules describe every vehicle by means of several stats such as armour, hitpoints, speed, etc. They are useful to know who gets first to some place and they can be used for chases, but don't expect too much detail, because they are actually very simple. The same can be said of the rules for firing against vehicles. With these, you can damage several systems of a vehicle, like the engine or the passengers. By being so simple, these rules are a tad too lethal for my taste. For example, two shots dealing more than 4 points of damage to a car that in turn hit the passengers (1 chance in 6, rolled randomly) means all passengers die (!). I'd rather have a higher level of detail, even if I never get to use these rules. Something like specifically pointing to the wheels or traffic influencing the driving roll or how the driving roll could influence the possibilities of firing against a vehicle from another vehicle in a chase. I haven't read yet the supplement Luther Artwright, but I believe the same rules are included in it. There is information about several kinds of ballistic armour and this teaches you that it's no use firing against a SWAT agent with .45 pistols. Finally, there are some other items to round up the chapter, like cameras to detect vampires or ammunition against supernatural beings. The following 25 pages of this section describe all supernatural powers characters can choose to have, plus the innate powers of their species. To start with, the Mystic Vision power all supernatural characters have. This works like the spell Witchsight described in the rulebook, with some additions. Then there are all the mutations and fae powers. The 20 mutations described are innate powers fae and half-fae can choose to have, that is, they are always on and many of them are like the creature features of the basic rulebook. For example: natural armour, lightness or limited flight. On the other hand, the 14 fae powers require spending magic points and most have the same effects as theist miracles, like Berserk or Chameleon. However, there are some original powers such as Bardic Voice or Elf Shot. The latter reminds me a lot of Gambit's power, that superhero who charges cards with energy and then shoots them at their enemies. These powers are used by rolling under a specific skill called "Fata" (POW+CHA). As for Folk Magic, it works exactly as in the rulebook. The only difference is that some spells are unavailable in this setting and there are three completely new ones. For example, one of these creates a magic barrier against supernatural beings. Mysticism also works as described in Mythras, but some of the talents are only available for "impressive" or "powerful" level characters. Others are slightly modified versions of the original ones and there are two completely new ones. After that it's the turn of psychic powers, which I guess will be very similar to the ones included in the Luther Artwright supplement. These powers require the use of the Psionics skill (POWx2) and are divided into 7 different disciplines, each focused on an array of powers with a common theme. Each discipline requires learning its specific Psionics skill. For instance, you can have Psionics of the Biokinesis school at 75% and be able to use powers like Psychic Wrack, Mind Shield or Eidetic Memory, but then you won't be able to use powers like Computer Telepathy or Mental Scan unless you develop a separate Psionics skill of the discipline that governs those powers. Other than that, this sort of "magic" works like the others: spending magic points and overcoming the victim in a opposed roll. The 8th discipline is only for shifters, which includes two powers: Beast Projection and Psychic Vampirism. The first allows them to create and control an animal through astral space or the mundane plane. The latter is the only way for these beings to regain magic points: by stealing them from victims who are feeling strong emotions. And that's not all. There is also sorcery, again exactly as in Mythras or RuneQuest 6. However, there is something new: rituals. By performing a ritual, characters can cast more powerful spells in an easier way, with the only caveat that they take days to cast. Ritual spells have an unlimited range provided you have a drop of blood from the target. Besides, the spell can have more or less Shaping points depending on the physical components the caster possesses of the target or targets. I fear this can be really destructive in the hands of creative players, so the game master should carefully consider the amount of havoc this can cause. Some spells differ from the description included in the Mythras rulebook and 4 new ones are described. There also exists the possibility for evil sorcerers to commit human sacrifices. This provides an augment to their sorcery skills so they can cast more powerful and successful spells. This rule could be easily used also in fantasy settings to create evil sorcerers to pit against your player characters. To finish off the section, you get the 9 powers only available for Elder Vampires, meaning those powerful vampires over 100 years old. These are really big, like immunity to sunlight, dominate wolves and bats, raising zombies and best of all: crowd control. This section is so complete it even has three magic items. Characters in After the Vampire Wars can go beyond the mundane plane. The Otherworld is a parallel plane of existence, a mix of dreamworld and the world of fae, goblins and other monsters like dragons! It can be accessed psychically through dreams and powers, or physically by going through magic gates. Time passes differently in there and the land is divided into "domains". Every domain is the theme of a dream and is created by the dreams of mortal beings. 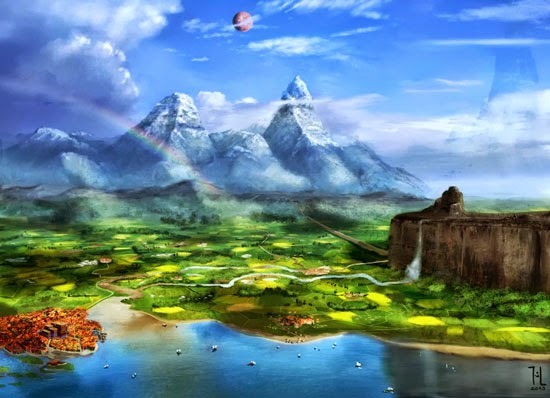 So a domain can be a speakeasy in Chicago during the roaring 20s, Tolkien's Middle Earth, a world of sci-fi technology or even the different visions of Paradise as seen by religions or H.P. Lovecraft's Dreamworld. Each of these domains, tiny or huge, is ruled by fae beings who feed on the feelings human beings experience when visiting them in their dreams. For example, if a fae feeds on fear, her domain might be a haunted mansion or a horror film set where humans go during their sleep and experience nightmares. As in the infinite number of parallel dimensions in Luther Artwright, the Otherworld of After the Vampire Wars opens up a billion possibilities for even the least creative game master. You could even play entire campaigns in this plane, travelling from one domain to the next one, while player characters search clues or chase their archenemy. The section covers how to travel between domains, the powers the rulers of domains have, what happens if they die and even how to take control of one of them! Therefore, it is also necessary to know how to find a nexus that bridges the material plane and the Otherworld. In those places performing magic is easier. Lastly, the differences between accessing the Otherworld in physical or astral form are covered, as well as how combat and supernatural powers work there. While the History section deals with the past events of the setting, this one deals with the everyday life of supernatural beings in "present" society. How they live, how public opinion feels about them and how they organize themselves. This section is crucial to understand the basic setting in the supplement. Take magicians, for example. You have magic crime, black magic and magic lodges and organizations. Three magic organizations are included as samples, and they all follow the excellent pattern from RuneQuest 6 or Mythras. A good chunk of this section is devoted to the world of vampires and their everyday life. This includes their power pyramid and how they feed. In the world after the Vampire Wars, most are normalized vampires, but there are also outlaws. To respect the law, normalized vampires buy blood in blood banks (take a good look at the cover) or else they have voluntary or paid donors. An interesting piece of text deals with how the different supernatural species relate to each other and what happens with monster hunters. Not all supernatural beings are available as player characters, so this chapter describes those who aren't: dragons, elementals, ghosts, ghouls, goblins and fae. They all often inhabit only the Other World, but some of them choose to live among human beings, either hidden or disguised in the mundane world. For example, changelings are fae who possess a human and pretend to be that person from that moment on. This is basically a bestiary, so the powers and stats of these creatures are included. I love it that you can find dragons and wyverns, and I like the story potential of goblins, otherwordly beings who can appear in the mundane world and hide in your city's darkest corners. This section is rife with ideas for scenarios. As if all the previous material was not enough, the last section devotes 13 pages to offering you several campaign ideas. The author classifies these into four main themes, and he offers some suggestions for each of them. For example, you could run adventures inspired by the noir genre with PIs or fugitives, with betrayal and the past as important aspects. Another theme is cinematic adventure, as in films like Blade or Underworld, though I'm pretty sure any of us could improve the original with just a couple good ideas! Another interesting possibility is to run a campaign during the Vampire Wars that shaped the setting. On the other hand, supernatural romance looks very off the beaten track as far as roleplaying games go, but it is also one which I would find the most challenging to run. In case you accept that challenge, you could find inspiration in TV shows like The Vampire Diaries or even films like Twilight. John Snead includes some advice and suggestions, but I don't know if they are enough for me to attempt anything like it (and then only for the right audience, of course!). To wrap it all, there is some advice on how to run several aspects of the setting and something I liked a lot: how to use this book to play in other settings. You could, for instance, run a campaign in a world where the supernatural is still kept secret, or even in a dystopian world. Even if the book does not mention it, an obvious choice is to play in White Wolf's World of Darkness or even in the Sixth World of Shadowrun. You could even play mutant superheroes like the X-Men using the half-fae and psychic powers, and not see even a single vampire (except for maybe old Morbius!). Why not use these rules to play a campaign in the urban fantasy shown in Bright starring Will Smith? In my opinion, it wouldn't be too difficult to create a campaign way cooler than the film. The possibilities this book seemed to offer intrigued me enough to buy it without much thought. I wasn't even planning to run a campaign with it in the short-medium run. It is a worthy purchase though. 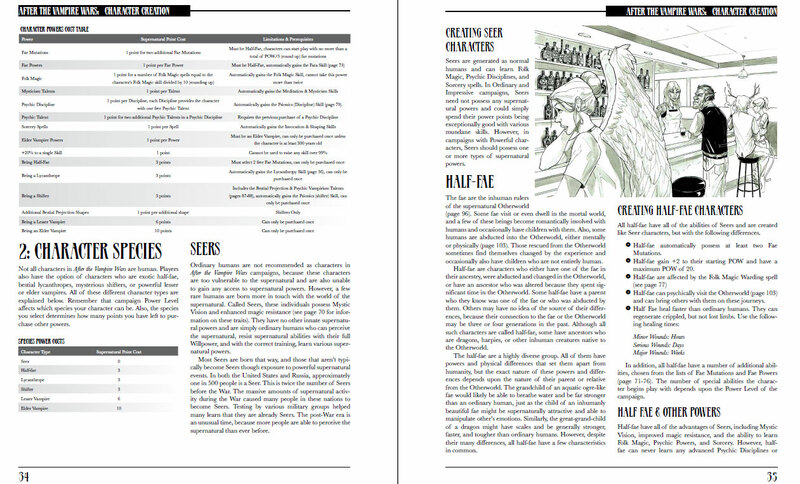 It opens up the game universe for RuneQuest 6th ed. aka Mythras in a big way, not only for urban fantasy, but for modern stories too. And now the World of Darkness is no longer the big hit it used to be in the 90s, perhaps it is a good moment to play it and scratch that itch with your favourite D100 system. However, a better use would be to use it to draw new blood into the roleplaying hobby. The reason is that nowadays there are so many famous TV series about supernatural beings that it would be easy for a GM to entice fans of those series to give RPGs a try. The boom of supernatural characters in TV shows and films might be waning, but hey, the PDF of this book was among the 10 best-sellers in DrivethruRPG after its release, so perhaps the urban fantasy genre is still popular enough to keep your group playing for years. All in all, a good addition to the RuneQuest family of products, and together with Luther Artwright, The Design Mechanism seems to be shaping their own version of the multi-genre Basic Role Playing System to encompass so many more settings apart from medieval fantasy, even if it is in several books instead of a «big golden book». If they go on like this, The Design Mechanism can draw many of the players who bought from Chaosium for their D100-fix beyond Glorantha or Call of Cthulhu. Plus, they will soon publish a scenario book for After the Vampire Wars, titled House of Crows, and I'm looking forward to seeing what sort of adventures it offers. Lastly, as someone said in the TDM forum: "now we can play vampires in Mythras, you could start with Mythic Rome, take your characters to Mythic Britain and, after some centuries, see how they fare in Mythic Constantinople and maybe even to Mythic Now to see how these 2000-year-olds rule the modern supernatural underworld!" That would be such an awesome mega-campaign if anyone manages to achieve it. This is perhaps the best thing of this supplement, that it lends itself to many different takes. What campaign would you run/play with it? I've already bought the book but with a different setting in mind... something of a mashup between Supernatural, NWoD, and the Sergei Lukyanenko's 'Watch' books... but you bring up some interesting ideas, like playing a historical mega-campaign (which brings to mind the old TV series 'Forever Knight'). I hope this game does well and gets some expansion, like larger bestiary... and maybe some stuff that's a bit 'weirder', drawing from sources like China Mieville's 'Bas Lag' stories. Your campaign idea sounds really fun. If you ever write some notes about it or write a log of your campaign, please let me know! I think further plans for After the Vampire Wars depend on how well House of Crows ends up selling. So we'll see. 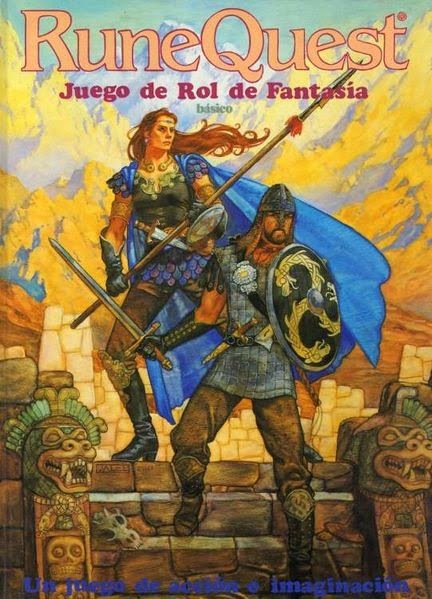 ¿Rolear bien o saber jugar en grupo?